James Morrison completed an enjoyable week at St Andrews as he signed off at The Open with his fourth sub-par round. The 30-year-old did not drop a shot as he matched the three-under par 69 score of his playing partner, five-time major champion Phil Mickelson, to finish on seven-under. "Watching him go about his business was an education," he told BBC Surrey. "We both played well, set each other off and I was just trying to stay in his slipstream really." Having once played cricket at youth level with current England captain Alastair Cook, Morrison grinned: "Now I've played with two of the world's great left-handers." James Morrison booked his place for only his second Open start (he came 23rd at Lytham in 2012) when he finished runner-up to Bernd Wiesberger at the French Open less than a fortnight ago. Weybridge-based Morrison, ranked number 95 in the world, should have done enough by his efforts this week to keep his place in the top 100 and earn an automatic invitation to the USPGA Championship at Whistling Straits next month. It will be his first major in the United States since the 2010 US Open, which was won by Graeme McDowell, and he goes with the backing of Mickelson, who said: "He looks a good solid player." Mickelson fired six birdies, double Morrison's number - but whereas the Englishman's round was bogey-free, he spoiled his own card by driving out of bounds at 17, when his ball ended up on a corporate sponsors' lounge balcony. 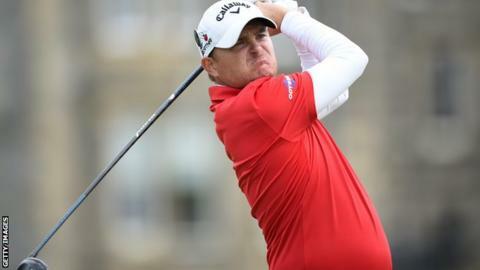 "He was great company," added Morrison, whose tie for 20th position beat his previous best Open result, when he finished in a share of 23rd place at Lytham in 2012. "He chatted quite a bit on the way round and it was a privilege to play with him. A great experience." Why do doubts surround Team Sky? Read more on Tour de France: Why are Team Sky attracting doubters?